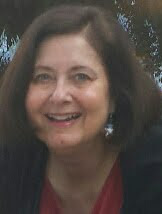 This level of income is well within the reach of many retirees, especially couples. If one spouse has Social Security benefits of $2000 a month and their spouse will receive $1000 a month, they could afford to retire in one of these communities. One of the requirements that AARP had in determining the best places to live on $100 a day was that they had to have "affordable luxuries". They defined this as cities with cultural attractions like museums or symphony orchestras, sports teams, great places to eat, and homes that sell for about $192,000 or less. In those instances in which I have spent time in a city, I have added my own comments to the AARP list. 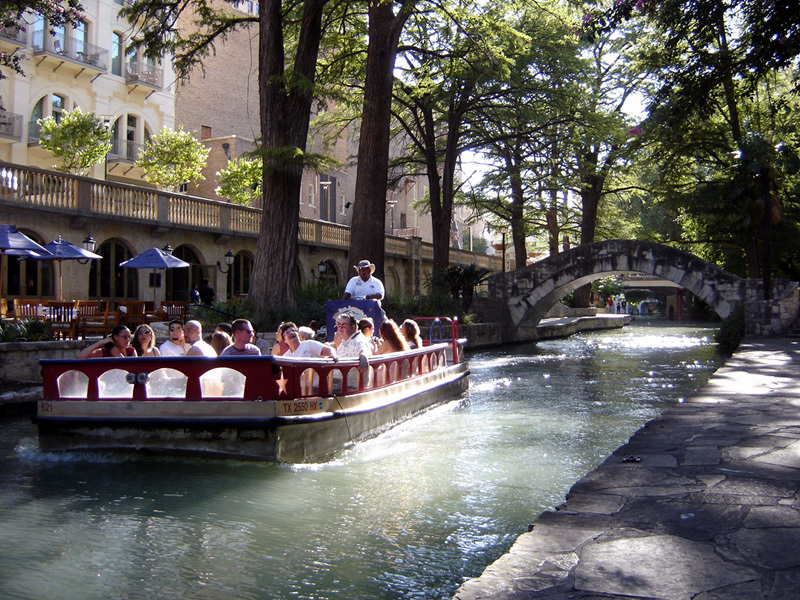 San Antonio, Texas: San Antonio is a charming town that is sunny 263 days a year. The median home price is $135,000. There are plenty of libraries, museums, golf courses and other affordable luxuries in this city. As a former resident of Texas, we have visited this city several times during the months of July and August and it is important to disclose that San Antonio gets HOT in the summer. 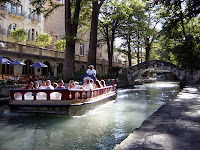 However, one delightful way to cool off is to take a stroll along the famous Riverwalk (pictured above) and perhaps have a cool beverage in one of the numerous sidewalk cafes. It's right across the street from the Alamo. Roanoke, Virginia: Roanoke is in the Blue Ridge Mountains of Virginia. It is sunny 217 days a year and has a median home price of $151,500. The city hosts half a dozen festivals every year, and the downtown area has a planetarium, theater and museums. One of our daughters went to college in nearby Lexington, Virginia and you should know that this town is about a four hour drive from Washington, DC, in a very rural part of Virginia. However, it is also in an absolutely gorgeous part of the United States, and is a lovely location for enjoying fall foliage. Las Cruces, New Mexico: Las Cruces is in the high desert of New Mexico, which means you can expect very hot summers. We have stayed in this town while driving across the country and love the desert landscapes. However, the scenery may not appeal to everyone. There are 287 sunny days a year, and the median home price is $148,000. I have not stayed in the remaining towns on the list, so I will only list the main statistics here. To read more, you can see the full descriptions at Best Places 2012. I just wanted to make sure that I brought these great cities to your attention, so you could add them to the locations you are considering for retirement. Spokane, Washington: Spokane has 176 sunny days a year, with a median home price of $145,000. It's a great city for people who love outdoor sports, whether it is fishing or skiing. As most people realize, Spokane is much rainier than many other popular retirement locations. However, we have friends who retired in this area, and they love it! Eau Claire, Wisconsin: Eau Claire is another location that is popular with people who enjoy outdoor sports, especially in the winter. It has 200 sunny days a year and a median home price of only $121,100. It is also home to a branch of the University of Wisconsin which provides lots of cultural, entertainment and adult education possibilities. Morgantown, West Virginia: Morgantown is a small college town in the center of Appalachia. It boasts an excellent healthcare system. There are 185 sunny days a year, and a median home price of $168,900. Pittsburgh, Pennsylvania: Pittsburgh is no longer a city that is defined solely by the steel industry. With a wonderful symphony orchestra and a beautiful waterfront, it has become popular with retirees. The 194 sunny days and median home price of $106,500 is very appealing, too. Omaha, Nebraska: Omaha is a Midwestern city that has become popular with high-tech companies in recent years. It has a symphony and the largest community theater in the United States. Omaha has 193 sunny days a year, and a median home price of $123,500. Grand Junction, Colorado: Grand Junction is a lovely town only a few hours away from the gorgeous ski slopes of Vail and Aspen. It also has 214 sunny days a year, and a median home price of $159,800. Gainesville, Florida: Gainesville is home to the University of Florida, as well as the Florida Museum of Natural History. It has 205 sunny days a year, and a median home price of $125,000. Florida has long been considered a retirement mecca because of low home prices and low taxes. It does get very hot in the summer.